Organic farming advocates are threatening to take the Industry Ministry to court if it refuses to revoke its decision to list 13 herbs as hazardous plants. 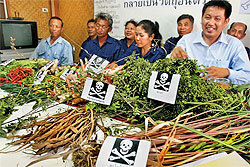 Witoon Lianchamroon of Biothai, right, farmers and organic farming supporters place ‘‘deadly’’ signs in front of 13 local herbs and plants which have been classified by the Industry Ministry as hazardous substances. They have demanded the ministry revoke the labelling scheme. Biothai, a non-government organisation working on organic farming, yesterday said it would file a case with the Administrative Court if the ministry insisted the announcement should stand, said Witoon Lianchamroon, its founding member. “The committee listed the 13 traditional Thai herbs without consulting those who would be hardest hit, who are the farmers, not large-scale hazardous chemical pesticide producers,” Mr Witoon said. Farmers yesterday gave the ministry seven days to revoke the list. The farmers said they would petition the prime minister if nothing was done. Tussanee Verakan, coordinator of the Alternative Agriculture Network, said the listing would hurt grassroots agriculture and organic farming. The network and its supporters said they would petition Prime Minister Abhisit Vejjajiva and the House committee on agriculture asking them to investigate the issue if the Industry Ministry ignored its deadline. They suspected a hidden agenda to favour big business was behind the ministry’s decision. “The announcement is not the right solution for the safety and quality control of pesticides and herbicides,” Ms Tussanee said. “In fact, they should focus more on controlling the level of chemicals in hazardous substances produced for mass markets. The listing of 13 herbal plants as “hazardous substances type 1” under the 1992 Hazardous Substances Act was made public on Tuesday by the Department of Agriculture, which sits on the hazardous substances committee. It requires growers, manufacturers, importers and exporters of pesticide and plant disease control substances to follow safety and quality control regulations, otherwise they will face six months in jail and/or a fine of 50,000 baht. The 13 herbs and plants are neem, lemongrass, turmeric, ginger, Chinese ginger, African marigold, Siam weed or bitter bush, tea seed cake, chilli, Chinese celery, ringworn bush, glory lily and stemona. A source on the committee on hazardous substances questioned the rush to approve the announcement. A representative from the Public Health Ministry opposed it at a Dec 24 meeting. A public hearing was planned for tomorrow but the announcement took effect on Feb 3. The Public Health Ministry was not informed of the approval by Industry Minister Charnchai Chairungruang. The source also suspected a former Agriculture Department chief, a northeastern politician who is serving a ban from politics but whose party is in the coalition government, and a multinational chemical company would benefit from the announcement. Verapong Kriangsinyos, representing the Thai Health Foundation, said the announcement would hit sufficiency agriculture. It would also block the development of local herbal medicines, food and cosmetic products. Deputy Public Health Minister Manit Nopamornbodee is said to favour revoking the announcement if it hampers the development of herbal products and alternative agriculture. The director-general of the Industrial Works Department under the Industry Ministry, Rachada Singalavanija, stated that the listing focused only on “pesticide” producers and traders. He said other activities could carry on as usual. “[Work on ] the Act was begun in response to the request of the Department of Agriculture, which found many organic farmers were concerned about fake or chemical-contaminated botanical pesticides,” he said.